Taste test: These kettle chips (as Sideshow Bob would say, the perfect side dish for revenge) didn't have a particularly strong or weak barbecue taste. 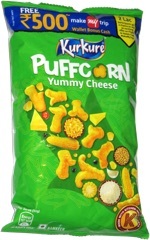 The underlying kettle-cooked chip's taste was far more dominant than the actual barbecue powder. When licking the chip first, there was a hint of barbecue taste, not really smokey but not really sweet either (kind of in the middle). 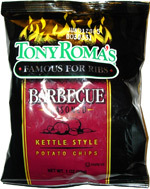 Since we've never been to a Tony Roma's restaurant, we couldn't tell you whether the barbecue taste on the chip was exactly like you'd get at their restaurant, but we're pretty sure it wasn't. Smell test: No aroma that smells like flavoring or potatoes.